AVENTINUS, a hermit in the Pyrenees who was martyred in 732 by the Moors as they invaded Gaul. COLMAN of DROMORE, St. Colman was the founding Bishop of Dromore in Co. Down, Ireland. Little is known of his life, though it is said he was a student of St. Ailbe of Emly (12th September), a friend of St. Macanisius (3rd September), and the teacher of St. Finian of Clonard (12th December). St. Colman reposed circa 610. DEOCHAR, a hermit near Fulda in present-day Hesse, Germany. St. Deochar was a spiritual child of St. Alcuin (19th May) at Aachen, before being appointed by Charlemagne (r. 768–814) to be the first Abbot of the Abbey of St. Vitus (St. Vitus Kloister) in Herrieden, Bavaria (Germany), and assisted in the translation of the relics of St. Boniface (5th June) to Fulda Cathedral in 819. St. Deochar is said to have restored a young boy’s eyesight through prayer. St. Deochar reposed in 847. 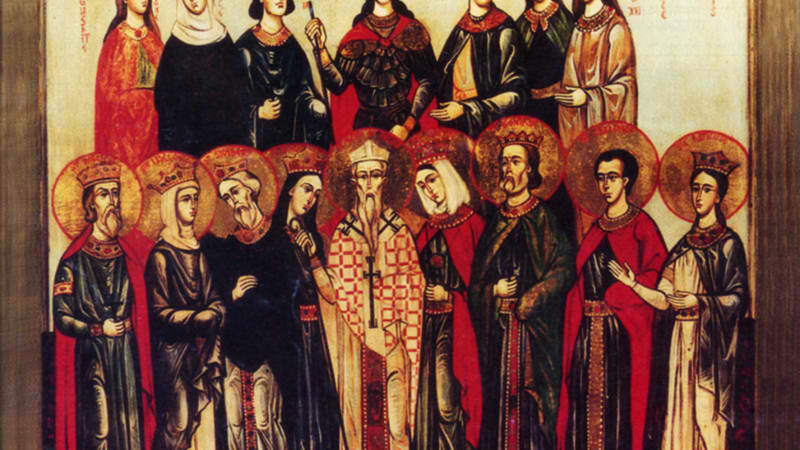 HABENTIUS, JEREMIAH, PETER, SABINIAN, WALLABONSUS, and WISTREMUNDUS, Monks near Córdoba (Spain) martyred in 851 during the reign of Emir Abd ar-Rahman II (r. 822–852). Several days after their death, the Moors burned their bodies, and the ashes were disposed of in the Guadalquivir River to prevent Christians from venerating the relics of these martyrs. MERIADEC, (Date Uncertain), though venerated primarily in Cornwall (England) and Brittany (France), St. Meriadec was most likely Welsh. Crossing over to France, he lived for a while as a hermit in Rohan in Brittany, and was later consecrated Bishop of Vannes in Brittany. ODO of MASSAY, Abbot of the Abbey of Saint-Martin de Massay in present-day Centre-Val de Loire, France, from 935 until his repose 967. VULPHY (WULFLAGIUS), a priest and hermit near Abbeville in Picardy (France). St. Vulphy reposed circa 653, following his repose a significant cultus of St. Vulphy developed in nearby Montreuil-sur-Mer.